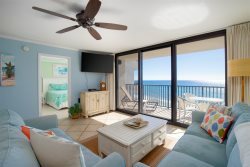 Beach, Boat, Bay & Gulf- 2bd/2ba with Views of Ono Island, Bridge and Ol` River (Perdido Bay). Directly across from the Beautiful Gulf of Mexico!! 2 Kayaks included! 2 Kayaks Included for Bay Use - Great for Watching the Dolphin - Ono Island Views 2 bd/2 ba - Sleeps 8 - Beautiful Sunsets! Property Size 1,100 sq. ft. If you don't want to spend a fortune, or race to the beach to get a place near the water, this is the perfect place! You can bring your boat or jet ski, book a fishing trip or just enjoy the beach and the river. Beautiful water front condo across from the Gulf of Mexico. Enjoy the balcony while you watch the beautiful sunset and the boats go by on Ole River that feeds into Perdido Bay, dangle your feet off the dock or fish and crab from the docks! Fun for children and adults alike! No need to pay for the dolphin cruise – watch them from the dock or balcony, they come by often. Enjoy the waves, sun and sand on the beach or watch turtles nesting from May thru September. You can reserve rental beach chairs and umbrellas for the entire stay or take your own. There is the mile stretch of undeveloped beach to walk, jog or shell search. At night the family can crab hunt! It is only a short walk to the beach with a cross walk for your safety and convenience. Amenities to enhance your experience include two swimming pools, private boat slips and dock. There is also boat or wave runner storage on property. We get major entertainment at our Wharf Amphitheater including Kenny Chesney, Taylor Swift, Kelly Pickler, Brad Paisley, ZZ Top, Gretchen Wilson, Montgomery Gentry, Bob Dylan, Willie Nelson, John Mellencamp...just to name a few in past year. There's great local entertainment year round. The Wharf shopping area features restaurants, shopping, movies, and entertainment and has one of the largest ferris wheels in the southeast U.S. Outlet mall shopping is always a good option! There are numerous restaurants for every taste and budget or have a leisurely meal in our well equipped kitchen. We have tried to equip our second home to make you comfortable and feel pampered! Come stay with us for a great vacation at a reasonable price. Though this wonderful home can sleep up to 8 people, we prefer to keep it down to 6 at the most. However, the bedding creates options for spreading out. My husband and I both agree that if we ever return to Orange Beach we will request to stay in 413. We had a magical wedding weekend, definitely one for the books! Excellent. I was very pleased with our accommodations. Efforts to make sure we were able to have access to the necessary information was successful. We would definitely try to stay with you when we are next in your area. We loved the accommodations. Everything was in good condition for a rental property. They were amazing. Very helpful and responsive. The condo was amazing. Very clean, spacious, comfortable, beautiful inside and the view also amazing. I could see my boat from the my room. Very courteous and responded within a timely manor. Only dislike is having to pay for a parking pass for one and only vehicle. Overall stay was great, excellent view, quiet, and comfy beds.